After almost a week of being stuck onshore due to rough sea conditions, we were granted with a beautiful, fall day yesterday. 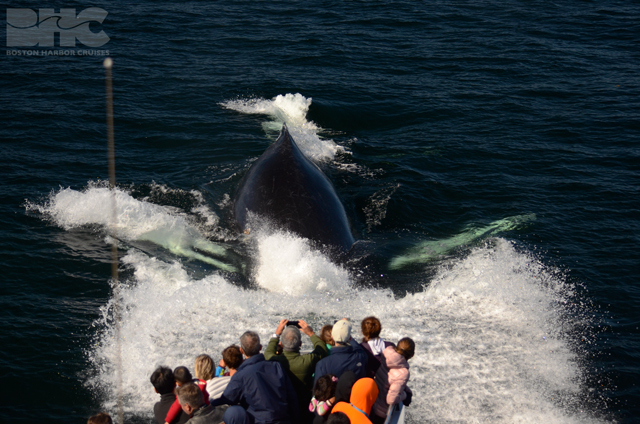 We were thus eager and excited to make our way offshore to see what the Stellwagen whales have been up to. After much thought, Captain Debbie and I agreed that our best bet was to head to the northwest corner of the bank where were greeted by an abundance of feeding humpback whales and a handful of minke whales! 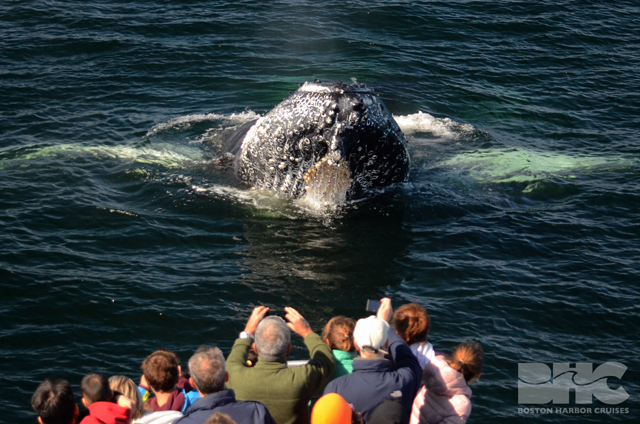 We were surrounded by humpbacks, bubble nets, and bait fish throughout most of our whale watch. 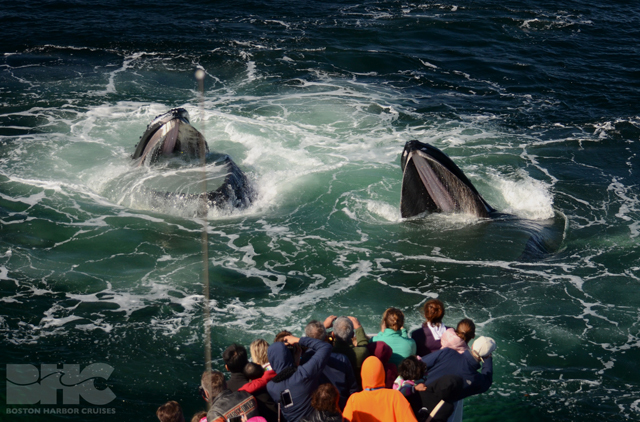 Time and time again, passengers waited in anticipation for these enormous marine mammals to immerge through bright green bubble spirals with mouths agape and bubbling with sand lance. 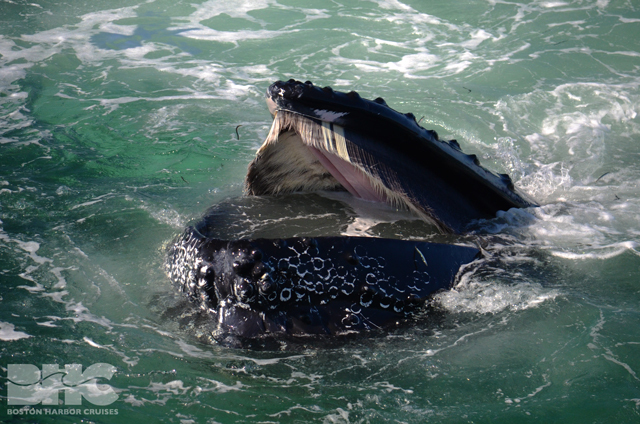 The thrill of watching bubble net feeding humpbacks is unmatched by much else in the world! Yesterday was no exception. 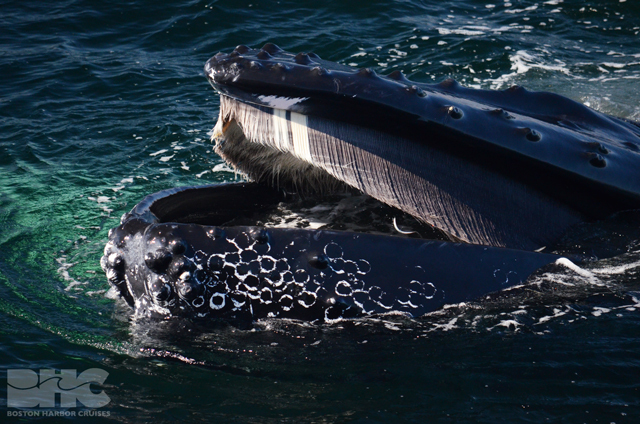 Two humpback whales surface next to boat with mouthfuls of food. Among the two dozen or so humpbacks in the area, we observed Jungle, Kappa, Follicle, Rocker, Pixar, Komodo, Aswan, Fern, Hippocampus, Circuit, Bennu, Banyan, Greenbean, and Habenero, as well as mothers Wizard, Etch-a-sketch, and Zeppelin. Although, we did not see Zeppelin’s calf, it is likely that the young one was nearby as calves tend to be more independent later on in the season. 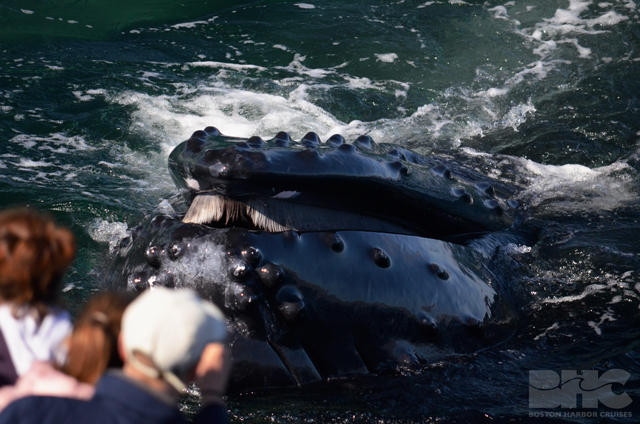 A great look at the baleen fringe in a humpback whale's mouth. A frequently sighted humpback named Sundown captured the hearts of many passengers yesterday with her spunky and inventive feeding antics. In addition to using powerful chin slaps and tail kicks to stun and manipulate sandlance, she also appeared to use the side of the boat as a means to corner the large schools of fish. Such a technique allowed passengers to look right into her mouth and gave everyone an opportunity to really get up close and personal with this clever cetacean. It was certainly a memorable day for us on the water. We really hope to get back to the bank again soon so we can enjoy the fall feeding frenzy! Fingers crossed!